"Star Trek: Discovery" will come to CBS All Access in fall 2017. 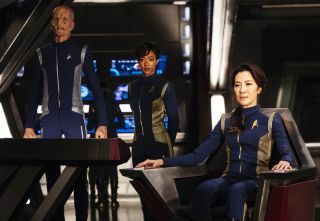 Pictured (l-r): Doug Jones as Lieutenant Saru; Sonequa Martin-Green as First Officer Michael Burnham; Michelle Yeoh as Captain Philippa Georgiou. The first full trailer for "Star Trek: Discovery" hints at a complicated past for one of its main characters, while bringing in famous alien species such as the Vulcans and the Klingons. "Discovery" is set about 10 years before the original "Star Trek" series that featured Capt. James T. Kirk, Science Officer Spock and other memorable characters. As such, the trailer focuses heavily on Spock's father, Sarek (played by James Frain). You can see more series here from our sister site Newsarama. But let's take a close look at our first glimpse of Trek's new chapter to see what's in store fans in the final frontier. The big "reveal" of the trailer is that Sarek has a special link with Cmdr. Michael Burnham (played by Sonequa Martin-Green). Sarek is a Vulcan alien; the species is known for its emphasis on logic and its requirement that the members of the Vulcan Science Academy — the keepers of the Vulcan tradition —purge all emotions. Spock from the original series, famously, was half-human. It turns out that Burnham is at least partially Vulcan as well, as shown in a clip from her childhood: "Your tongue is too human," Sarek says to her, suggesting that Burnham will never properly learn the Vulcan language. The "Star Trek" franchise, which has been delighting viewers for more than 50 years, follows the adventures of several captains working for the Federation of United Planets, an interstellar republic that includes Earth, Vulcan and other planets. Exploration, defense and diplomacy for the Federation is conducted under an entity called Starfleet. The opening of the trailer shows Burnham and Capt. Philippa Georgiou (played by Michelle Yeoh) walking on a desert planet. In typical Vulcan fashion, Burnham (the first officer) asks her captain where she is going, logically adding, "We have no map, and you can't set a course without a star." Georgiou replies that it's hard to believe that Burnham has been serving under command for seven years, adding that it's time that Burnham have her own command. Georgiou then whips out a classic "Star Trek" communicator: a flip-phone design that inspired real-life early cellphone makers after appearing in the original series. "Two to beam up," she intones. A starship dramatically appears through the murky clouds of the planet as Burnham and Georgiou use a transporter to beam up to the ship. Because Georgiou called the ship over, it appears that it must be her ship, the USS Shenzhou. Shenzhou quickly shows its capabilities as it warps into a new location, with another shot giving a brief glimpse of the show's new uniforms. Then, Sarek speaks to Burnham. Appearing by hologram, he says, "Great unifiers are few and far between, but they do come. Often such leaders will need a profound cause for their followers to rally around." Then, we see Burnham putting her leadership skills into action. After alien science officer Lt. Saru (played by Doug Jones) says the ship found an "object of unknown origin," Burnham gets into a spacesuit to check out the situation. She flies out into space and is surrounded by an asteroid belt as Sarek intones, perhaps in lines cut from another scene, "What have you done out there on the edge of Federation space?" Very quickly, we learn that the object may have something to do with the Klingons, which were considered a hostile race during the first "Star Trek" series. We catch the Klingons (who have shorter hair than what fans are used to) apparently in the middle of a burial ceremony. Back on the Shenzhou, warp signatures of Klingons appear on the map. "Contact Starfleet Command — we have engaged the Klingons," Georgiou says, as the traditional red-alert sound plays in the background. As the Shenzhou faces battle, Georgiou says Starfleet "doesn't fire first," but Burnham counters that they have to. Photon torpedoes are fired into space. Then, Saru gives an ominous prophecy: "My people were biologically determined for one purpose alone: to sense the coming of death. I sense it coming now," he says. The last few seconds show Burnham standing on the unknown object, squaring off against somebody in a huge suit of armor. Because the individual is wielding a weapon that looks like the Klingon Bat'leth, there may be a fight coming with the Klingons. We're still waiting on an exact release date, but after multiple delays, CBS seems pretty intent on releasing "Star Trek: Discovery" in the fall. It will premiere on CBS All Access, a direct streaming service that starts at $5.99 a month, with 15 episodes for its first season. There will also be a companion aftershow called "Talking Trek." You can watch the entire trailer here from CBS.